Eating healthy, well-balanced meals is important part of a healthy lifestyle. In addition to healthy eating, regular exercise is important for everyone. For those people who have diabetes or who are at high risk for diabetes, diet and exercise is even more important. Balancing what you eat and staying active are key to managing diabetes. Having diabetes does not mean that you can't enjoy a wide variety of delicious foods. People with diabetes have the same nutritional needs as everyone else. You can learn to eat healthful meals, and even include your favorite foods so that you can thrive with diabetes. Sometimes it helps to discuss a lifestyle with diabetes with others. We invite you to attend a free support group at Johnson Memorial Hospital. 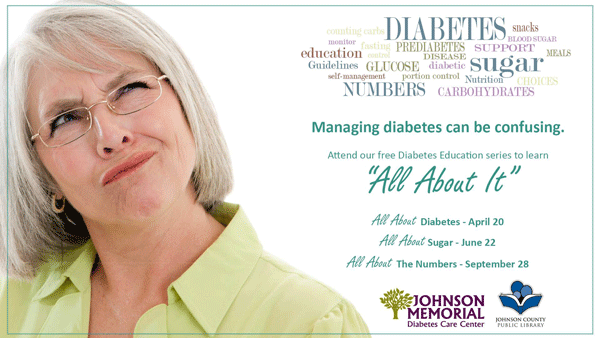 Our internal medicine specialists are also available to answer questions and help you with diabetic care. Understanding carbohydrates may be one of the most important lessons in managing your diabetes. The balance between the amount of insulin in your body and the carbohydrate you eat determines your glucose level. You will hear a lot about the glycemic index when learning about foods for diabetics. Basically, the glycemic index is the amount that a carbohydrate containing food raises your blood sugar level or glucose level. A food with a high glycemic index raises blood sugar more than a food with a low index level. For more important information about the glycemic index, click here. An important meal planning tip is to combine a food with a high glycemic index with foods with a low glycemic index. This will help balance out the meal and help keep your blood sugar more regulated. Knowing what to eat can be confusing for everyone. There is always news about the latest and greatest superfood or fad diet. 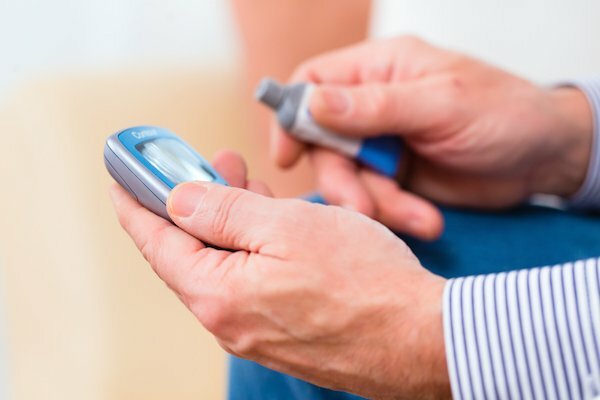 Learning to make healthy choices, that have stood the test of time, will help you manage your diabetes without worrying about the next big thing. These tips will help you know what to focus on as you plan your meals. Grains: If you are going to eat grains, be sure to choose the most nutritious grains. Choose whole grains which are loaded with vitamins and minerals. Try to avoid white-flour based grains that lack nutritional value and often contain a lot of sugar. Starchy Vegetables: Potatoes, peas, corn, and other starchy vegetables are also a good source of vitamins and minerals. Limit adding extra sugar and fat to these to get the best bang for your buck. Non-Starchy Vegetables: Vegetables are full of vitamins, minerals, and phytochemicals. Since non-starchy vegetables have a low glycemic index, you can eat as much as you want! Choose the varieties without added fat, sugar, or sodium. Fruits: Fruits are loaded with vitamins, minerals, and fiber just like vegetables. Since fruits also contain carbohydrates or starches, you will have to be careful with the amount you eat. Still, choosing fruit for dessert is a much better choice than ice cream! Protein: Foods high in protein like fish, chicken, meats, or soy products are an important part of a balanced diet. Look for lean varieties that do not have a lot of saturated fats. Dairy: Dairy products, such as yogurt and milk, are a great way to get much needed calcium. Fats: Not all fat is bad for you. Stick to good healthy fats, and avoid saturated and trans fats. Your heart and your waistline will be glad you did. Drinks: Food is often the focus when you think about a diabetic diet. Sugary drinks, like soda, can negatively affect your blood sugar. Stick to water, tea, or coffee. If you must have soda or flavored water, make it a zero-calorie drink to avoid all the added sugars. This is a top 10 list of low-glycemic superfoods that are loaded with vitamins and minerals. Try to make these part of your daily eating plan. Even though these foods pack a lot of bang for your buck, you still need to eat appropriate amounts. Beans: Beans are high in fiber, magnesium, and potassium. While they are actually considered a starchy vegetable, they can pack as much protein as a piece of meat without all the fat! Green Leafy Vegetables: Spinach, kale, collard greens and other dark green leafy vegetables are high in fiber and low in calories. Eat as much as you want! Citrus Fruit: Grapefruit, oranges, lemons, and limes all boast a healthy dose of fiber and vitamin C.
Sweet Potatoes: Sweet potatoes have a lower glycemic index than regular potatoes. They are filled with vitamin A and fiber. Berries: Strawberries, blueberries, and raspberries are loaded with antioxidants, vitamins and fiber. Try a homemade parfait for dessert. Just top yogurt with your favorite berry. Fish with Omega 3s: Stay away from breaded or deep fried fish. Salmon is a good, healthy choice for this category. Whole Grains: Look for germ or bran, barley, and oatmeal. These have the most nutrients. Nuts:Nuts have healthy fats, magnesium, and fiber to help you stay full longer. Some nuts, such as walnuts and flaxseeds, contain important omega 3s. Fat Free Milk and Yogurt: The calcium in dairy products is important in building strong bones and teeth. Sometimes it helps to discuss a lifestyle with diabetes with others. We invite you to attend a free support group at Johnson Memorial Hospital. For more information, contact Carla Duncan, RN, at (317) 346-3846 or e-mail her at cduncan@johnsonmemorial.org.